The drumstick is a fairly common vegetable grown all over India and Pakistan. This food is a good source of Protein, Zinc.This food is high in Cholesterol and Sodium. It is antibacterial and a wonderful cleanser. Nutritionally, drumstick pods and leaves are of great value as sources of acrotene, calcium, phosphorus and vitamin C. The leaves, flowers and fruits of drumstick which are used as vegetable have great nutritional value. Poppy seeds paste : 1 tsp. Heat oil in a kadai, add mustard seeds when seeds are crackel then add drumstick, pumpkin,potato,salt and turmeric powder, cook till vegetables become half tender. 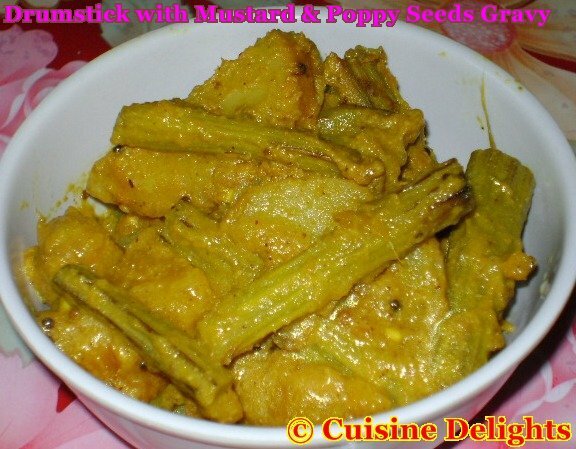 Now add mustard-poppy seeds, green chilli paste, salt, sugar and turmeric powder, mix well with vegetable. Add one cup of warm water, increase heat and bring to a boil. Reduce heat to medium and cook covered till it forms a thickish gravy, approx 10-12 mins. Finally serve with hot steamed rice.